Moringa Probiotic Health Booster drink is a naturally fermented liquid probiotic and nutritional supplement. It consists of a combination of unique beneficial probiotic microorganisms based on Efficient Microbes (EM) technology, herbs, and nature’s unique super-food – the incredible Moringa Oleifera tree. What does Moringa Probiotic drink do? What Are Probiotics And How Is Moringa Probiotic Different? The word “Probiotic” comes from the Greek word “pro”, meaning “promoting” and “biotic”, meaning "life". Probiotics are live micro-organisms which when administered in sufficient amounts provides great health benefits and helps restore the balance of the body’s healthy microbes. Moringa probiotic drink has been formulated to help maintain a balance of beneficial (good) bacteria that help to fight the bad bacteria. The human body needs enough good bacteria to thrive and be healthy. 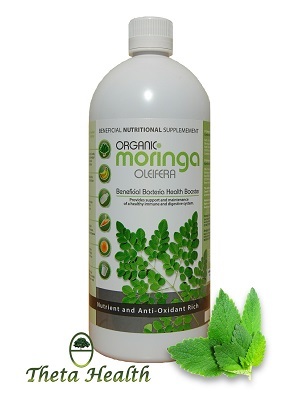 ORGANIC MORINGA HEALTH BOOSTER is a naturally fermented liquid probiotic and nutritional supplement, consisting of a combination of unique beneficial probiotic microorganisms based on EM (Efficient Microbes) technology, herbs, and nature’s unique super-food – the incredible Moringa Oleifera. Efficient Microbes in the form of healthy living good bacteria promote good nutrition and aid our bodies in fighting disease by strengthening our natural immunity. Why Is The Combination Of Efficient Microorganisms (EM) And Moringa Oleifera Unique? Efficient Microbes is the only bacterial technology available whereby the probiotic is naturally fermented and contains multiple classes of micro-organisms, including lactic acid and phototropic bacteria as well as beneficial yeasts. Nearly every other probiotic contains the strains of only one class – lactic acid bacteria. Using multiple types of microbes is the only truly effective means by which bacteria can stay fully active and properly establish themselves in the human body, and be of significant benefit. The action of Efficient Micro-organisms in providing humans with mutually supportive bacteria that are able to influence the entire bacterial population of the body has never before been uniformly achieved. Moringa contains Vitamin A, Vitamin C, Calcium, Potassium, Iron and Protein in high concentrations that are easily digested and assimilated by the human body. These are just a few of the 90 nutrients, as well as over 45 anti-oxidants, that make the Moringa tree one of the most nutritious plants known to man. Probiotic bacteria help to balance the digestive system and the body as a whole. Organic Moringa Health Booster is the only herbal probiotic available on the market, combining the immense health benefits of Moringa Oleifera and natural herbs with the powerful effects of beneficial bacteria.